A British apple pie is the classic dessert or tea time treat. The pie is the stalwart of baking and practically every country has their own style. This one is a traditional British, and also Irish, one. Cinnamon is an optional, and not a traditional, flavor in the UK. Though it is found here more often now as the flavor has crept over from the US. 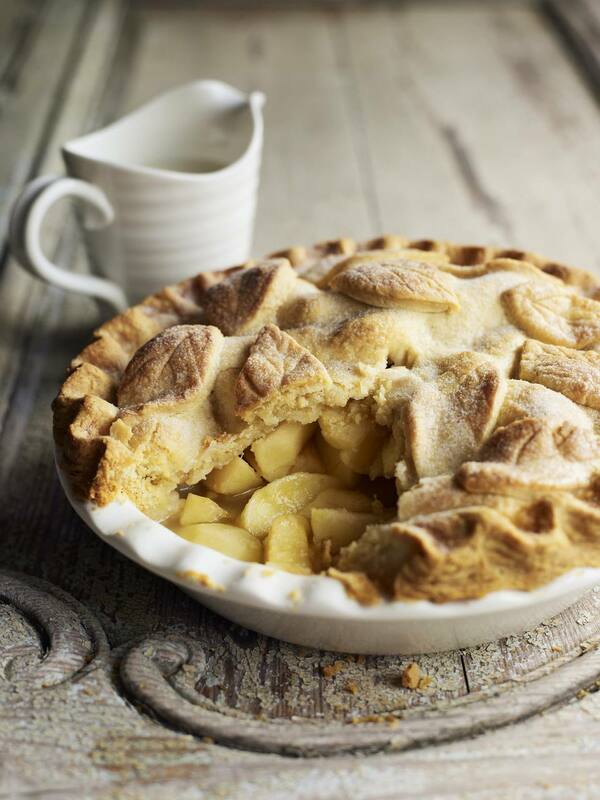 The perfect apples for this pie are Bramleys. They have a lovely balance of sweet to acidic, and provide a nice tenderness when cooked, which makes them the best. If you do not have Bramleys, then feel free to use any good cooking apple. And, if really stuck, a good dessert apple will also work, though the apples will not be as soft when cooked. Place the flour, butter and salt into a large, clean bowl. Wrap the dough in clingfilm and chill for a minimum of 15 minutes, up to 30 minutes. Heat the oven to 425F/220C/gas 7. Simmer the apples with the lemon juice and water in a large pan until soft. Add the sugar and cinnamon to the cooked apples. Remove from the heat and add the butter and leave to cool. Roll out half the pastry and line a 7" (13cm) pie dish. Put the cooled, cooked apple mixture into the pastry case. Roll out the remaining pastry to make a lid for the pie. Damp the edges of the pastry in the dish with a little cold water, cover with the lid, press the edges firmly together and crimp to decorate. Brush the top of the pie with milk and bake in the middle of a hot oven for 20 - 25 minutes. Serve hot or cold with cream, ice cream or custard sauce. Note: The dough can also be made in a food processor by mixing the flour, butter and salt in the bowl of the processor on a pulse setting. When the mixture resembles breadcrumbs, add the water, slowly, through the funnel until the dough comes together in a ball. Wrap in plastic and chill as above.